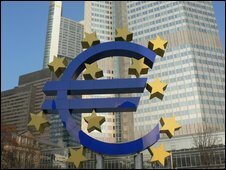 The European Central Bank (ECB) has lent a record amount to eurozone banks hit by the financial crisis. Banks borrowed 442.24bn euros ($623.8bn; £376bn) of unlimited one-year funds at the lowest rate the ECB has ever offered. The ECB has lowered interest rates to a record low of 1% and is lending huge amounts to banks to boost lending and revive recession-battered economies. The ECB is now lending banks funds for up to 12 months, up from six months. The previous record for the ECB's money-market refinancing operations, which provides short-term loans to commercial banks, was 348.6bn euros of two-week loans in December 2007. The ECB has so far resisted unconventional monetary policy measures to boost the economies of the 16 countries that use the euro, preferring to lend to banks directly to revive the credit markets. The US Federal Reserve and the Bank of England are buying government debt directly to pump their economies with cash while rates are also at historic lows, a policy known as quantitative easing. The Bank said this month it would pump an extra £50bn into the UK economy by buying government and corporate debt, extending its planned spending to £125bn. Unlike the US and the UK, the ECB cannot buy European government debt because it would have implications for the deficits of individual countries and thus go against the ECB's mandate.